The purpose of this lab is to help you understand how to create and use arrays. The main concepts include defining and initializing arrays, passing array elements to functions and assigning function results to array elements. The code will also illustrate how to print out elements of an array to the Simulator UART1 I/O window. Click on the Lab10.X folder. 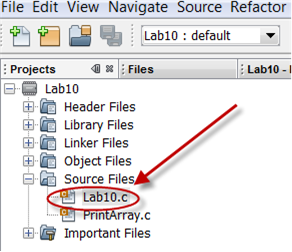 Open the Lab10.c source file from the project tree by double clicking on its icon. In this lab, some of the code has been placed in a separate file to keep things simple where you need to make your edits. Specifically, the printArray() and print2dArray() functions have been placed in the file PrintArray.c. Note: the elements are all of type int. Pass the two arrays you declared above (array1 and array2) to the function add_function() (see its definition below). Store the result of the function in the array result. The idea here is to add each corresponding element of array1 and array2 and store the result in result. In other words, add the first element of each array and store it in the first element of result, then add the second elements, and so on. Take advantage of the counter variable i to make this happen. Click on the Continue button. This begins the simulation.Wait for the UART 1 Output window to finish printing. Click on the Halt button. This will stop execution so that we may examine the results. So, both the arrays look similar. To initialize them as part of their declaration, all you needed to do was follow the declaration by an equals sign and a comma delimited list of data enclosed in curly braces. Here you have learned how to create and use arrays. Frequently, arrays are manipulated within loops where the same operation needs to be carried out on a series of related variables, as we have seen here. The array index may be a variable, which gives us tremendous flexibility for accessing arrays based on some conditions we setup in our programs. Arrays may also be used in a lookup table like scheme, where a variable is used as an offset into the table (via the array index) to retrieve a particular value from the list (array values).